Ask fellow campers about "Water Sports RV Park & Campground" and nearby attractions. This was the friendliest campground we have been to in awhile! Very well maintained and helpful! With the Kansas drought it has affected their water but that did not bother us. This campground has been in business for many years and they know how to take care of their guests! They had very nice lots with plenty of room for our 5th wheel and it's slide outs! We will be back to stay again! We camped at Water Sports RV Park & Campground in a Fifth Wheel. I think this park is a great find. The staff was exceptionally friendly. The facilities were very clean and well kept. The spaces were nice sized pull throughs with room for slides. Full hook-ups included Wi-Fi & basic cable. The on-site laundry was one of the nicer ones that I've used. They also sold some convenience items in the office, like ice, milk, soda, etc., a nice thought that saved me a trip to the store a couple times. Don't be put off by the negative reviews out there, it's a nice place to stay. Yes, the lake was mostly dried up but that is no fault of the RV park, it's like that all over Kansas. There are mobile homes on the other side of the park but it was no different than any other mobile home park out there and definitely not a reason to feel unsafe. We stayed here for three weeks and we were very happy with our stay. We will return if in the area again. We camped at Water Sports RV Park & Campground in a Fifth Wheel. Very nice and quiet private campground. They have full hookups. There is a great lake area for boating, swimming, and fishing. Would recommend. We camped at Water Sports RV Park & Campground in a Fifth Wheel. A basic park with much of the property reserved for seasonal sites along the lake. Our pull through site was very long, but a little narrow to park the truck next to the trailer. Large fields are available for pet walking and a nice enclosed pet run. Short term visitors can fish for free in the lake, but can not boat. We camped at Water Sports RV Park & Campground in a Travel Trailer. Worked for quick overnight stop, but would certainly try to arrange space elsewhere... but not sure there is better campground in the Dodge City area... will certainly try to find / reserve one next time. If you are here during Dodge Days, plan to attend the rodeo. Great show! There is some RV parking by the train next to the visitor center. Since it is early in the season, we were able to leave our rig there while we stopped there and visited Boot Hill and the Wyatt Earp statue. A trolley is available. 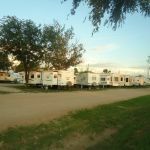 Are you affiliated with Water Sports RV Park & Campground ?